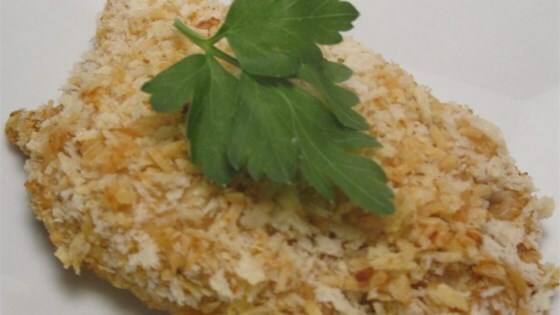 "Wonderful baked chicken with a spicy twist! Your taste buds will love it!" Preheat the oven to 375 degrees F (190 degrees C). Spray a broiler pan with cooking spray. Whisk buttermilk, 1 teaspoon taco seasoning, and cayenne pepper together in a bowl. Mix remaining taco seasoning, bread crumbs, Parmesan cheese, flour, onion powder, salt, and black pepper together in a separate bowl. Dip chicken in buttermilk mixture; coat with bread crumbs mixture. Place coated chicken in broiler pan. Bake in the preheated oven until chicken is longer pink in the center and coating is crispy, 30 to 35 minutes. An instant-read thermometer inserted into the center should read at least 165 degrees F (74 degrees C). This was a nice change to having chicken. Turned out pretty good.